Out of retirement to teach the first ever class from the new Fiber Arts Studio, Gail Tremblay has assembled a brilliant group of master weavers for you! 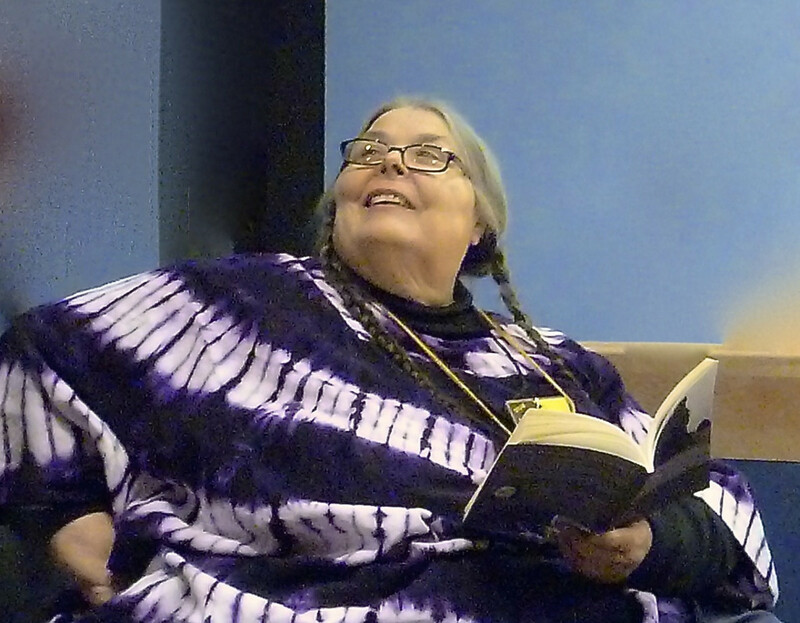 Writer, teacher, and mixed media artist Gail Tremblay (Onondaga and Mi’kmaq),was born in 1945 in Buffalo, New York. Tremblay taught English, Native American Studies, Art, and Art History at Evergreen State College in Olympia, Washington, where she joined the faculty in 1981. As an educator, she has influenced more than a generation of Native and non-Native students and has been instrumental in building Evergreen’s focus on Native arts and Native Studies. In the 1980s, while she was teaching a Third World and Feminist Film Theory class, Tremblay began weaving baskets out of scrap 16mm film, old movie trailers, and outdated educational films. 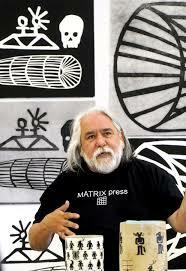 In perfect postmodern irony, Tremblay, who has been making baskets since childhood, utilized materials from a medium that often originated and propagated stereotypes of Indigenous people in order to create “traditional” baskets that critique those same stereotypes. Her titles often allude to the film source, which is frequently obscured by the weaving. JOE FEDDERSEN…former Greener faculty member! 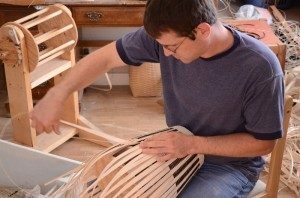 Jeremy Frey started weaving in his 20s, learning to make baskets from his mother Gal Frey. Gal taught him, drawing on what she had learned from her teacher Sylvia Gabriel. Sylvia was renowned for her basketry, especially her porcupine curlwork. Jeremy learned all aspects of the tradition from selecting brown ash to pounding and preparing basket stuff. His work fuses traditional shapes with the innovative use of both traditional and non traditional materials, as well as unique signature designs. Jeremy was born in 1978 and raised in Indian Township. His work has received national recognition with the 2011 Best of Show award at the Heard Museum Guild Indian Fair and Market and the Santa Fe Indian Market. He was the recipient of a $50,000 United States Artists grant. 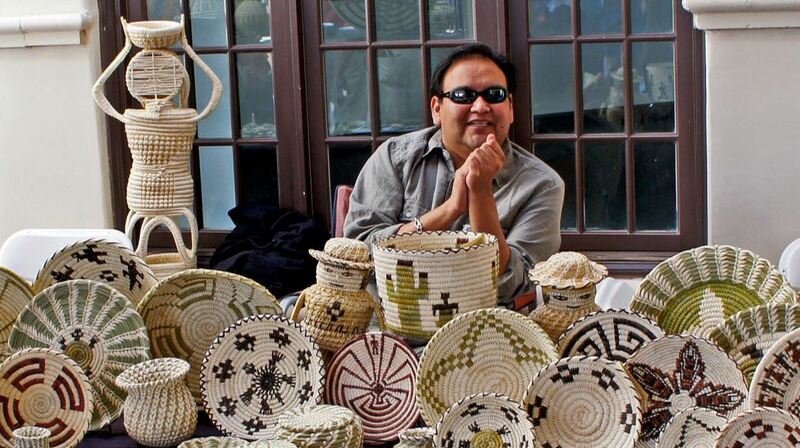 Terrol Dew Johnson started basketry weaving at the age of ten. He soon learned that he was a born natural and found that it was one of the few things in life that he found intrinsically effortless. Johnson is a member of the Tohono O’odham nation of southern Arizona. 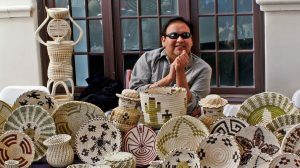 The Tohono O’odham have a long history of basket weaving using a whole variety of techniques using natural materials and dyes. These are all used in order to tie the basketry in with the local landscape colours and flora, making the baskets part of the community and of the larger landscape. The traditional basketry weaving techniques that Johnson learnt at such an early age, have allowed him to expand into the world of contemporary fine art basketry, while still keeping hold of his traditions, which he uses as a foundation or anchor point for his subsequent career as an artist. Lisa Telford (Everett) was born in Ketchikan, Alaska, in 1957. 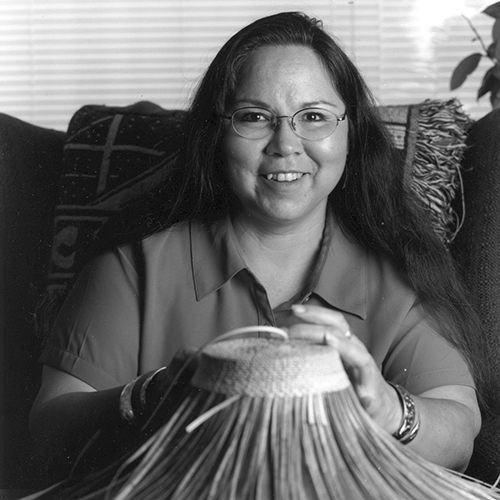 As a Gawa Git’ans Git’anee Haida weaver she comes from a long line of weavers including her grandmother, mother, aunt, cousins and daughter. Lisa harvests and prepares her own material, using red and yellow cedar bark and spruce root. The gathering of materials takes her hundreds of miles from home and hours of preparation that vary depending on the final product. Bark is traditionally stored for one year and then must be processed further. Her baskets may be seen in the collections of The Oregon Historical Society, Hallie Ford Museum of Art, The Smithsonian National Museum of the American Indian, The Heard Museum, The Portland Art Museum, and The Burke Museum. Lisa also received a 2000 GAP.